Canterlot High is hosting a musical showcase and Rainbow Dash, Applejack, Pinkie Pie, Rarity,and Fluttershy are going to be performing with their new band, The Rainbooms. But when a new girl group, The Dazzlings, arrives at CHS, they convince everyone to turn the friendly showcase into a Battle of the Bands. 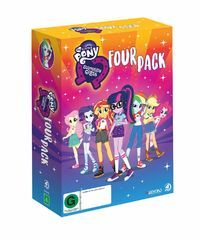 As tensions mount between the competing musical acts, a reformed Sunset Shimmer realizes that the Dazzlings may not be ordinary girls and are after something far more sinister than just being named Best Band at Canterlot High. The Rainbooms call on Princess Twilight to return to their world to help them perform a musical counter-spell so that they can win a battle that now determines the fate of the entire school. Canterlot High meets its rival school, Crystal Prep Academy, in a competition thats a long-standing tradition, The Friendship Games. Sunset Shimmer feels homesick for the magic of Equestria while she and her friends compete against Crystal Preps top students led by someone with an equal amount of interest in Equestrian magic, this worlds TWILIGHT SPARKLE. When Canterlot High School goes on a trip to Camp Everfree, theyre surprised to find a magical force is causing strange things to happen around camp. With the help of the Mane 6 and especially Sunset Shimmer (who refuses to give up on her), Twilight Sparkle must confront the dark Midnight Sparkle within herself and embrace her newfound magical abilities to save the camp. Grab some popcorn and enjoy three magical adventures starring everybody's fa­vorite characters from Canterlot High as they enter a music video contest, go behind the scenes of a movie and encounter an enchanted mirror!